The Tinkers specialise in performing traditional Irish acoustic music. 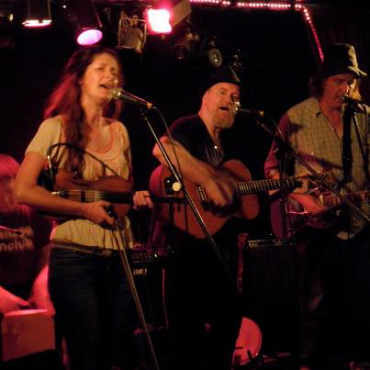 Rebel songs, reels, jigs, ballads, hornpipes, polkas.We have played many gigs recently including the MONA Museum in Hobart, Illawarra Festival, Marrickville Cultural Festival, Nolan on Lovel Gallery Katoomba, Joadja Winery Berrima, Kelly’s Newtown, Penrith Panthers, Chado Hobart, The Irish Society Ceilidh Wollongong, The Lark Distillery Hobart. Born in Ireland, Evelyn Finnerty from Blarney, Co, Cork grew up in a musical family, and was raised the traditional way, spending many childhood days in musical settings and sessions. She is a master of traditional Irish music and well known around the traps as a dervish on the fiddle. Evelyn plays regularly with the band “Shameless Seamus and the Tullamore Dews” featuring Midnight Oil’s Jim Moginie and members of Mental as Anything, “Blackwater” featuring award winning Irish chanteuse Suzanne Toomey and PJ Cullen, and played with the likes of Jimmy Moore and Martin Doherty.A resident of Australia since 1993, Evelyn is an established and highly regarded fiddle player on the Irish music and Australian folk scene throughout Sydney and Australia. Alan Healy was born in Dublin, Ireland. He is a highly regarded exponent of the bodhran, tenor banjo, bouzouki and guitar, Alan teaches Irish traditional music as well and has performed with many Australian and International artists including Shameless Seamus and the Tullamore Dews. Like Evelyn, he is a stalwart of Sydney’s Irish music scene and an Irish scholar specializing in Joyce and Beckett. Alan has been involved in the art world for some 30 years as a visual artist and sculptor, exhibiting at many of his own sellout shows. Born in Dublin, multi instrumentalist, John Healy will bring middle eastern rhythms to the Tinkers.with his Egyptian Darabuka. John lived and played world wide before settling in Australia. 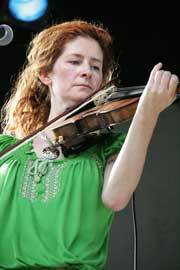 Evelyn Finnerty is a master of traditional Irish music and well known around the traps as a dervish on the fiddle.